I love surprises. Several years ago my coworkers organized a surprise party for me. I was shocked. First off, I am very observant and I never miss a thing. Secondly, for the first time in my own house I was enjoying the presence of my American friends alongside of my Hispanic friends! Surprise and multicultural fellowship all in one night. Simply put – amazing. This kind of joy and unity flows from the New Life that Christ offers us. His resurrection from the dead offers us new life, a life full of hope and awe. The joy that we experience at Easter is a joy that Christ offers to us daily – and we can receive it if we remain open to His love. Sometimes He unexpectedly gifts it to us, like a chance visit with friends or the times when we experience the forgiveness and love of those who know us and care for us. His gift comes in moments of happiness but also in moments of sorrow and gloom. The Gospel tells us of the surprise of Easter Sunday morning when Mary Magdalene experiences a new encounter with Jesus Christ in a totally unexpected way. Her heart had certainly been crushed as she witnessed the terrible torments of Jesus’ suffering and death. There, in the shadows of pain and confusion, He appears, the One that restores and fills everything with light and life. 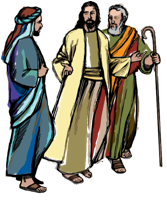 Jesus tells her to announce the news and to comfort his brothers. Unfortunately there are many who no longer expect surprises and spend years and years without experiencing in their own life the tremendous blooming of the new life in Jesus Christ. Even we evangelizers could become accustom to a controlled faith and lack the freshness of an unexpected encounter with Christ! And sometimes, Easter can become merely a circular and monotonous process, where we keep indefinitely the same chains that are binding us to our selfishness and limitations, all of which prevent us from seeing new possibilities, stealing the power of love needed to reach out to the brother, the one that has not yet been consoled! Such an Easter is a superficial encounter with Christ. What can we do in these circumstances? Remember the scriptures and renew our faith and hope in Him who comes to us, shows us his wounds and touches us! “Why do questions arise in your hearts? Touch me and see…” (Lk. 24:38-39) Trust in his grace and prepare our hearts to see the light coming from his risen face. But above all, let us take the necessary risks to find Him, following the example of the women who went out early in the morning to the tomb, eager to give honor to the body of Jesus, unjustly tortured and abused. Without a doubt, he will allow us to find Him if we courageously follow in his footsteps and risk our life to accompany Him among the poor and the suffering. This surrender will fill our hearts with the joy of the Good News of the resurrection that transforms suffering and tears into hope and joy. He will provide the means to heal the shallowness of our faith and once again transform us into messengers of His triumph over fear and death. Pope Benedict XVI in his Urbi et Orbi message of Easter invites us to continue walking with Christ even amidst the pains and sorrows of this world, committed to the transformation of the world with the joy and the knowledge that we do not walk alone. Let us celebrate that joy, He is with us until the end of time. Let us bring the power of his resurrection to touch the lives of all still weeping because “they have taken away their Joy and they do not know where they put Him” (Jn. 20:13). We know where!